2 easy miles & a Full body w/o. 163 days till the Boston Marathon 2019!!!! 3 mi on the small block this am. 162 days till Boston '19. 3 mi on the small block and a FB W/O. Hey everybody, “GET OUT AND VOTE” !!!!!!! 4 mi on the big block this am. 32*, no wind, full sunshine. w/o! 35 minute Tempo run this am. 42*, cold, windy, & sunny. 1 mile on the short block, then a Full body w/o at the gym! 4 am miles on the big block, 34*, windy (8mph), overcast, 64% humidity. 5.5 mi on the Porter Rockwell Trail, 32*, 54% humidity, lite breeze. this will be a rather lite week considering the medical appointments and holiday....Oh well, it's all figured into my recovery and build up to the start of training for the 2019 Boston Marathon. I've chosen and designed an 18 week training schedule that starts on Monday December 10th. 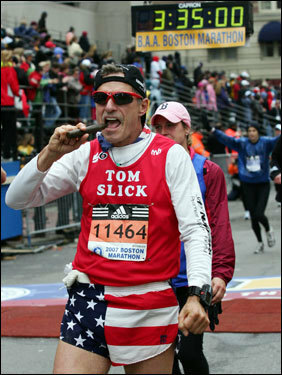 My overall goal is to run a 3:45:00 / 8:30 mpm at Boston in 145 days !!!! Rest Day, Whole Body Physical at my friendly doctors office today! Dr. "B" stated that I am in the best physical condition that he has seen in a guy my age. He said to continue doing what ever I'm doing to stay in such great mental and physical shape! "BP" - 104/64, wt 169 lbs, setting heart beat - 52bpm at almost 68 years of age, more stats later as the lab results are printed, if anybody is interested ! 1 mile on the short block w/a full body w/o . thats enough for today. 5.5 mi on the short block w/ 6 X 400's. 28*, 48% humidity w/8 mph breeze, then a full body w/o with steam at the end. Hey you all, "Happy Thanksgiving"! 3 nice relaxed miles around the short block. This run felt great! 1 mile at 188 strides per minute and a Full body -W/O. 4 mi on the big block starting my last week of pre main schedule training, then it’s off to the races! 35*, 8 mph breeze, partly cloudy! 3 mi Tempo run this am. 3 mi easy run this am.